I’m writing this before work instead of taking a shower. I hope my coworkers appreciate it. You know how it’s a good idea on your first ride out to go around the block a bunch of times so that you aren’t far from home just in case something happens? Holy crap is that bike fun. But at least it’s not heavy. Spiky Bike did great in true ring-a-ding-ding two-stroke zippy fashion part of the way out-of-town. I thought I heard something ‘not quite right,’ so I pulled over and listened for a few minutes. Seemed fine, but then ‘rational thinking’ took over and I decided I should turn around and ride more in town and not so far from home. I got back to town and got to a stop light. The RD bogged down and died. I tried kicking it over a couplea times to no avail. 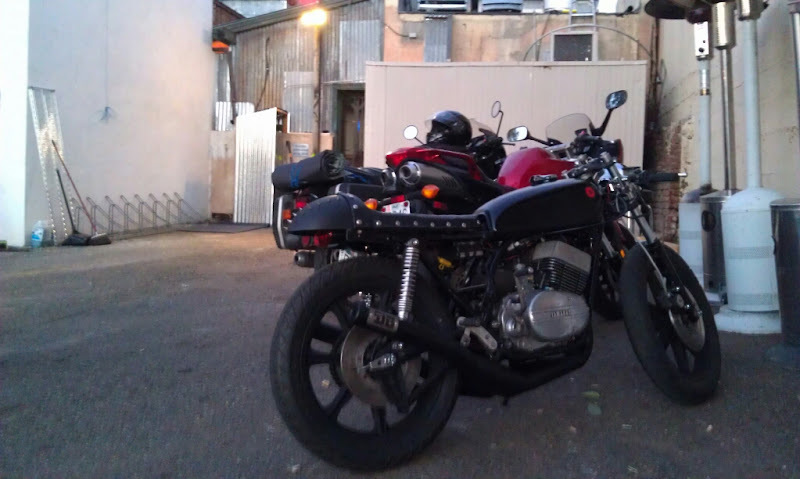 So, pushed the bike to a side street and a friend went to get a spark plug puller. A very helpful guy (I put the italics in there to indicate sarcasm) stopped by and gave me a whole bunch of advice about what to do. He suggested I CHECK THE SPARK PLUGS. And MAYBE ITS FLOODED. Truth be told, he really was just trying to be helpful. But please, people, before offering your sage advice, determine what your audience already knows first. Pulled the plugs and they were a tad rich. That’s what the road surface looks like up close. We cleaned off the plugs and made a plan to try to avoid stop lights. I kicked the Spiky Bike over and away I went! Until I didn’t go anymore. At the first stop light about two blocks away. 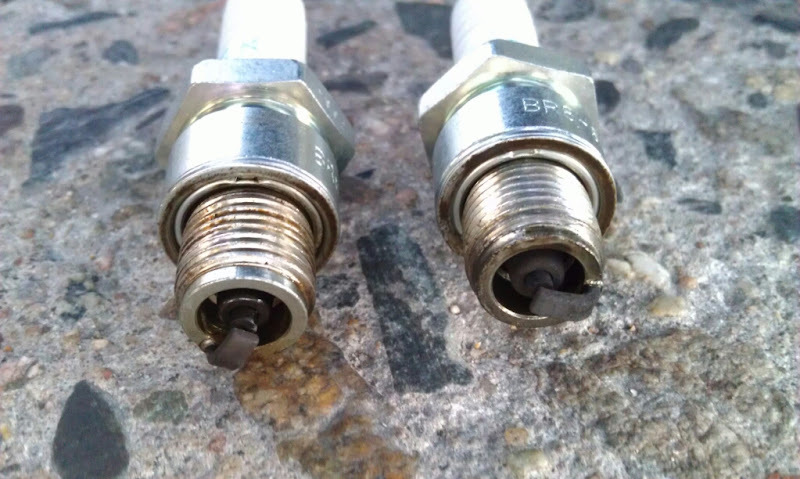 Cleaned the plugs again, and away I went! According to witnesses, there were flames coming out of my left pipe. 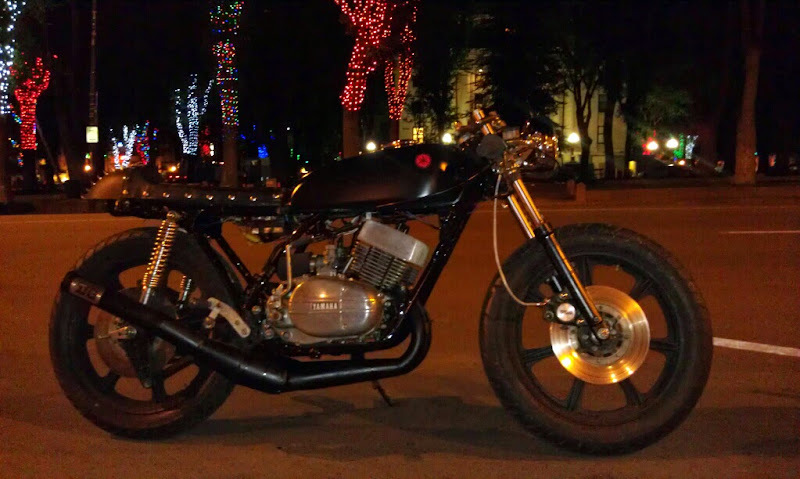 Luckily, the bar wasn’t much further, so I opted to push Spiky Bike the rest of the way. It was downhill all the way to the alley I was planning to use to cut across to the bar, so I got on Spiky Bike and coasted. I pushed the RD through the alley and as I emerged to the next street I heard my name wafting down from above. Some friends of mine were sitting in an outdoor area at an upstairs bar. We chatted briefly about my situation, then on I went. Only two more blocks to go! Our group gathered and I told them about the Shake Down Run. Luckily, one of the guys had a pickup truck there so after dinner we loaded it up. The RD is light enough that three guys just picked it up and put it in the truck. No ramp necessary. Ha! I didn’t get pics of that though because I was in the truck playing catcher. I count this as a success. That first stretch was fantastic fun! I’ll pull the carbs this week and go from there. 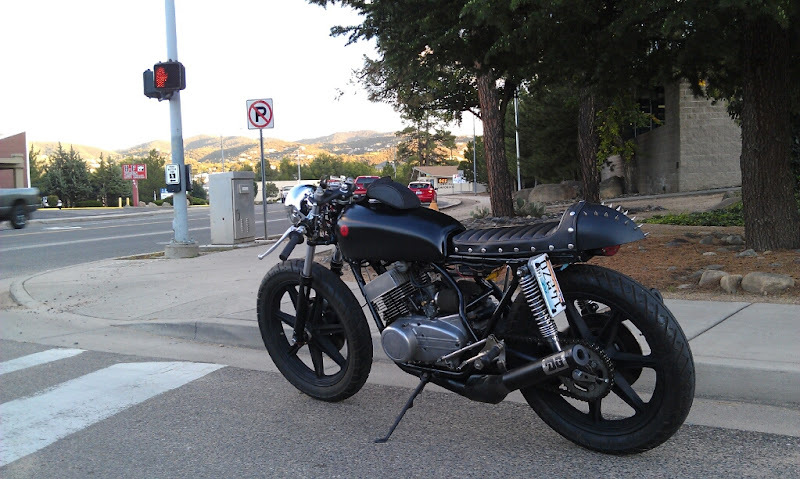 This entry was posted in motoring and tagged cafe racer, RD350, ring a ding ding, vintage bike by hoyden. Bookmark the permalink.